This report contributed by Mukta Chakravorty in Bangalore. If you, like me, are a die-hard fan of Italian cuisine, then get ready to tantalize your taste buds at Alba, the fine dining restaurant at the JW Marriott, Bangalore. For the first time the Chef de Cuisine, Antonello Cancedda, brings you an exclusive gourmet experience from the island of Sardinia, which also happens to be his hometown. 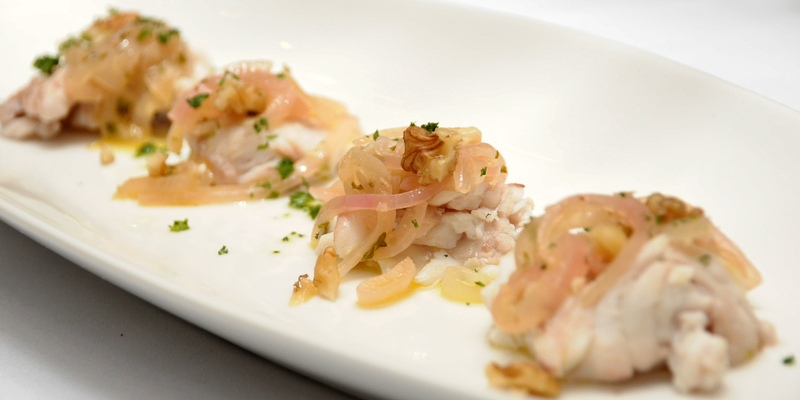 Chef Antonello draws inspiration from the authentic recipes passed on to him from his ancestors over generations. On a Tuesday evening, we got an exclusive preview of the fare and what an enthralling gastronomic journey it turned out to be! The first thing you notice as you enter Alba is its classy and unique decor. The seating is in the amphitheatre style, with the tables arranged along a semi-circular stairway. There is a show kitchen which displays Italian herbs, fresh ingredients and a selection of wines, among other things. This space is used to set up live counters where the chef dishes up your favourite pastas or salads in front of you. However, this time we were to sample the dishes from the four course pre-fixed menu. So we took our seats and waited eagerly for the evening to unfold. We were greeted by Chef Antonello who gave us a bit of insight about the island of Sardinia and its cuisine. Situated in the middle of the Mediterranean Sea, Sardinia is the second largest island of the Mediterranean after Sicily. Sardinian food is simple, fresh and scrumptious as it uses a lot of organic ingredients. Many of the island’s inhabitants are engaged in agriculture, farming and fishing. Hence lamb and sea-food feature prominently in the cuisine. Sardinia is also famous for its Pecorino cheese. By this time, our appetites were sufficiently whetted and we couldn’t wait to see what the chef had in store for us. We started with a bread basket that included two kinds of breads along with sundried tomato pesto and basil pesto dips. The breads were made of semolina and you would be hard pressed to tell the difference! One of the breads was the quintessential Sardinian special ‘carasau’ or music bread as it is commonly known as. 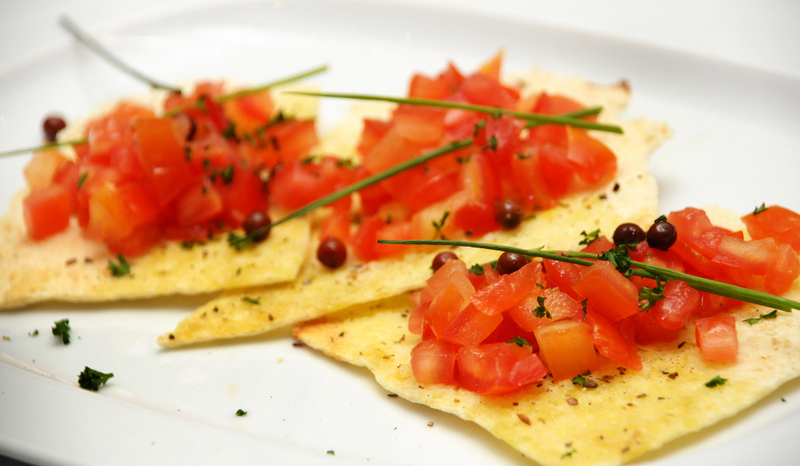 It is a thin, crisp flatbread that gets its name because of its resemblance to fine, thin music sheets. Paired with the two dips, they tasted mouth-wateringly delicious. Delicious mains and a guitar strumming chef! Our first course was the antipasti which included Millesfoglie di Carasau con spuma di asparagi, fave e patatine (thousand layers of music bread with asparagus mousse, fava beans and thin sliced potatoes); Sa Burrida (halibut with walnut and white wine) and Aragosta al finocchietto selvatico (lobster in a wild fennel salad). All the three dishes were stellar. The asparagus mousse especially had a creamy texture and went well with the crisp music bread. The halibut and the lobster were extremely fresh and we kept asking for more. The red wine sangria I ordered for myself went well with the antipasti. The next course was the Zuppa di carciofi patete which was a mildly flavoured soup made of artichokes, potatoes and Italian parsley. Some might find the taste a bit bland; however, I enjoyed the flavours of the artichokes in the soup. The main course consisted of Lasagne di pane carasau di zucchini (Sardinian flat bread lasagne with zucchini). Usually I find this particular preparation quite heavy. But this one was light and had a ‘melt-in-your-mouth’ texture, with the flavours beautifully balanced. Next came the Panada or the potato and lamb pie. Finally, we tasted the Sardinian special ‘Culurgiones’ which was a hand crafted mint and potato ravioli in pecorino and San Marzano tomato sauce. Although all the three dishes were unique, for me the winner was the lasagne. And I should mention the best part of the evening – while we were tucking into these delicacies, we had the chef serenading us as he went from one table to another, strumming his guitar and crooning melodies in Spanish, and even some in Hindi! A gastronomic journey you’ll remember for a long time! A meal as sumptuous as this couldn’t be complete without the ‘dolci’ or the desserts. And the chef had outdone himself in creating two special desserts for us – Bianchittos (an almond meringue) and a Formaggelle – Pardulas (saffron and orange pie). The meringue was so light that it seemed to be made of air; the almonds giving it a crunchy texture. One bite and I was transported to dessert heaven. 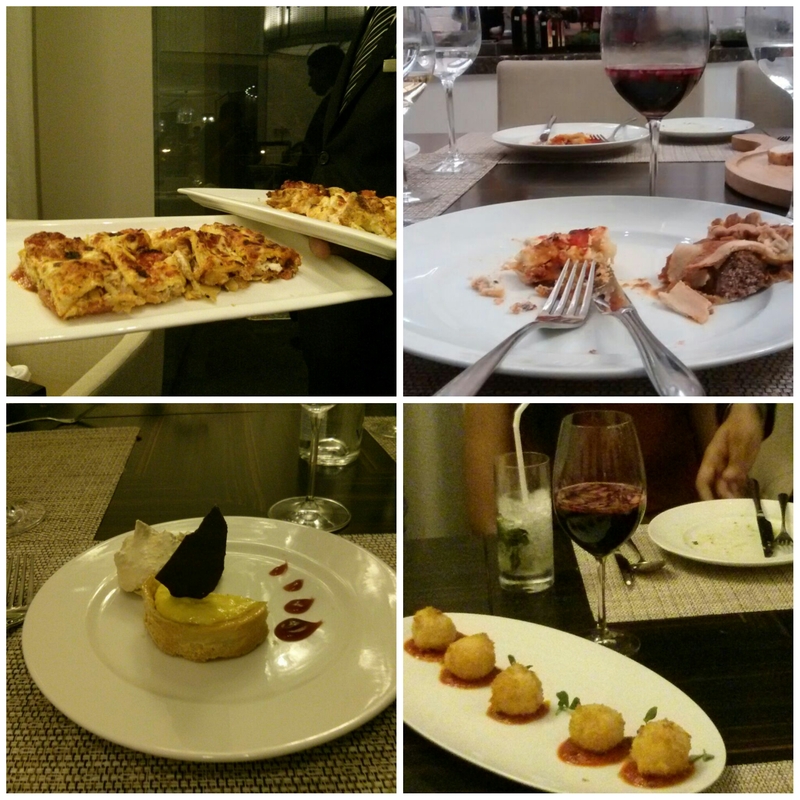 We came home extremely satiated by the food, ambience and the general mood of the evening. You can’t possibly resist the desert! Tempted as yet? 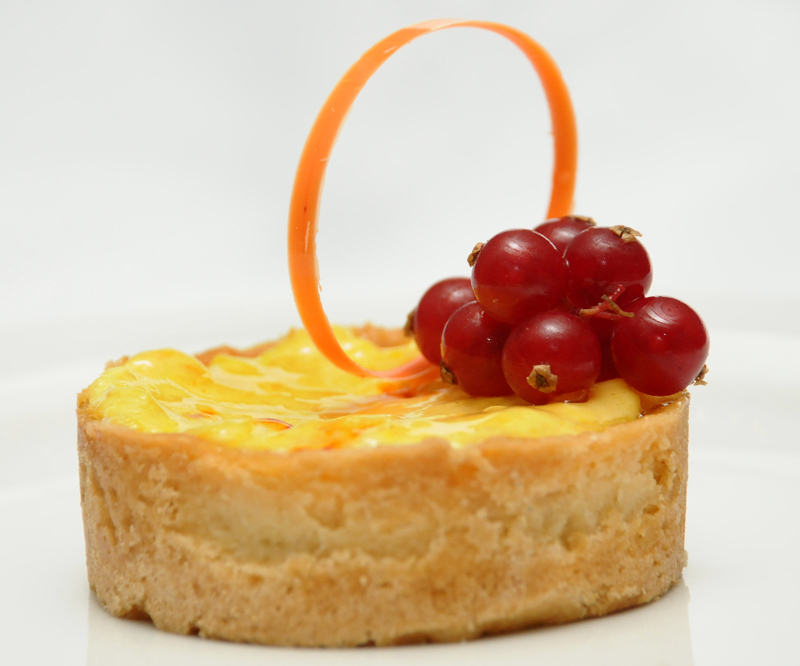 Join the gastronomic journey at Alba. This particular Sardinian food festival is on till March 29. You can also enjoy a wide variety of Sardinian dishes from the specially crafted a-la-carte menu. (PS: On an invite from the JW Marriott, Bangalore).